2 of my favourite things. Chocolate fairy buns and cookies!! Why not bake them both together!?! Guest post from Dr. Oetker. Average up to 80 Min. First make up the cookie mixture. Line a large baking tray with baking parchment. In a bowl, beat together the butter and sugar until creamy and well blended. Beat in the egg yolk and Caramel Flavour. Sift the flour and Baking Powder on top and add the Chocolate Chips. Mix together to form a fairly firm dough. Form 200g (7oz) of the dough into 12 balls the size of large marbles. Put on a lined plate, cover and chill until required. These will be used in your cake mix. Divide the remaining cookie dough into 20 small pieces and form into balls. Place on the baking tray, spaced a little apart and chill until required. These will be baked into mini cookies for decoration. Now make the cake mixture. Preheat the oven to 180˚C (160˚C fan assisted oven, 350˚F, gas mark 4). Line 12 muffin tins with the Muffin Cases. Put the margarine, sugar, Vanilla Extract and eggs in a bowl. Sift the flour, Cocoa Powder and Baking Powder on top and whisk all the ingredients together until well blended. Spoon half the mixture into the cases and push a large marble sized ball of cookie dough into the centre of each. Spoon over the remaining cake mix to cover the cookie dough. Bake for 22-24 minutes until risen and just firm to the touch. Transfer to a wire rack to cool. Raise the oven temperature to 190˚C (170˚C fan assisted oven, 375˚F, gas mark 5). Bake the remaining cookie dough balls for 10-12 minutes until lightly golden. To decorate, make the buttercream. Put the butter in a bowl and beat until smooth. Gradually sift and beat in the icing sugar until smooth and creamy. Mix in the Vanilla Extract. Spread a generous amount of buttercream on top of each cake and decorate with a few Chocolate Chips. 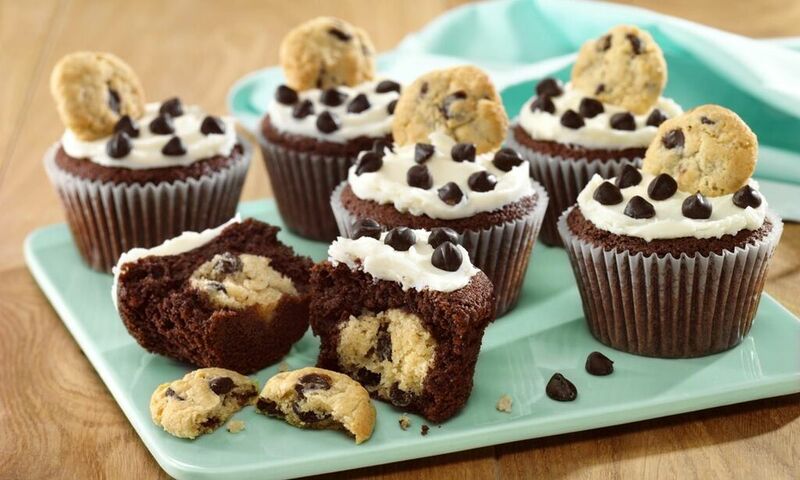 Gently press a mini cookie into the top of each cake to serve, and accompany with the remaining cookies on the side. About this post: This is a guest recipe from Dr. Oetker. No Payment was received. "Autumn Outfit Layering From Fat Face.."